The silly patten is just for trying to catch invalid names. But inspection didn't find any issue. Can any one confirm this behavior ? 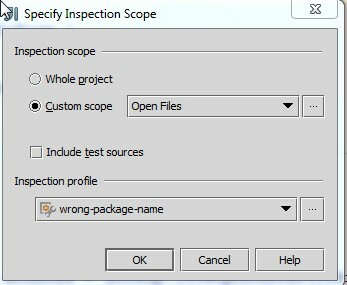 On the screenshot the custom scope = open files. Looks like a package is just not taken into account as "open file". Please try different scope. I tried all scopes: Project, module and current file. No luck.
" Since this inspection requires global code analysis, it is only available in batch inspection mode." Can this be the reason ? If yes, why this limitation ? It will be very useful for us if we can mark in red wrong package names. What IDEA version do you use? In IDEA 13 (upcoming) I'm now blocked with http://youtrack.jetbrains.com/issue/IDEA-112678 . Hope it will be fixed soon, then I'll continue. Didn't get your point. Did you mean you will look on this issue only after the mentioned one ? Yes, because currently I can't specify name pattern. After the fix I'll recheck, if the problem persists. Tried 132.46 with different scopes and patterns like [a-y]*, [a-b]*, [a-b]+. It founds a lot for me. Sorry, can't reproduce the issue. If it still occurs to you, please, create an issue in the tracker, maybe developer will be more lucky.